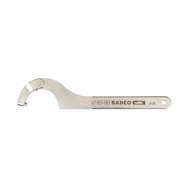 Pin spanners are also known as 'pin keys' and can be both adjustable or with fixed jaws. They work slightly differently to other spanners, in that they grip the fastener with pins that go through the head and attach to the fastener, rather than gripping from the outside of a nut or bolt to turn. All of the pin spanners that we sell are made from high performance alloy steel.